Despite having stunt doubles and rigorous safety procedures in place on movie sets, many actors have been injured, or even died, whilst performing their various roles. Even seasoned actors have been hurt thanks to freak accidents or potential safety risks not being alerted to the appropriate people. Here are six instances where famous actors have been injured on movie sets and how this affected their respective films. Possibly one of the most famous incidents of an on-set death in the whole of cinema history is the fatal accident that caused Brandon Lee’s death. The son of Bruce Lee, Brandon was set to become the next big action movie star, before his untimely death occurred in 1993. The script required that Lee be ‘shot’ by Michael Massee, a fellow actor in the film, in a scene where Lee returned home carrying groceries. Unfortunately for Lee, the firearms expert had been told to leave early. A faulty prop gun was then used which ultimately ended his life at the very young age of 28. It transpired that the gun was not properly cleaned or checked before use. It was only dry fired by the prop master between scenes. When it was then fired by Massee a fragment of a dummy bullet shot out from the barrel of the gun along with the intended dummy bullet. This bullet fragment hit Lee in the abdomen, causing critical injuries which eventually led to his death later in the hospital. The death was deemed accidental and so no charges were made against Michael Massee, however due to the incident, Massee took time off from acting. Proving his worth as an actor, even when injured, Leonardo DiCaprio carried on acting when he cut his hand whilst filming Django Unchained. During a tense and heated moment in the film where his character starts a monologue, DiCaprio slammed his hand into a glass, shattering the glass and cutting open his hand. Ever the professional, DiCaprio continued on without immediate medical attention and even added to the scene by smearing the blood onto his face evoking terror in his fellow actors who were also in the scene. After completing the shot, he sought medical attention and required stitches. However, no time off was required, and the production of the movie continued as normal. Who knew that being stranded on a desert island could be so dangerous! Instead of a usual injury that many actors will sustain on set, Hanks instead contracted an infection that nearly killed him. Before production was wrapped and they eventually left the island, Hanks gained a small cut on one of his legs. He luckily realised that it had somehow gotten infected and visited a doctor. He was then told that his swollen leg was due to a staph infection, and that he was very close to having fatal blood poisoning. As the old adage goes ‘never work with animals or children’. Both were in the mix for National Velvet as Elizabeth Taylor was just 12 when she starred in this career-defining film. Unfortunately Taylor fell off a horse while filming the horse racing movie National Velvet, injuring herself badly. This injury was also the start of her chronic back problems and she went on to endure over 100 operations during her lifetime. These back problems were heightened by her life-long battle with scoliosis, or curvature of the spine. She’s also had many other unfortunate injuries on movie sets she worked on, including on Elephant Walk where she needed surgery to save her sight after a fragment of flint became embedded in her eye. This is a case where an on-set injury was written into a film by a director. 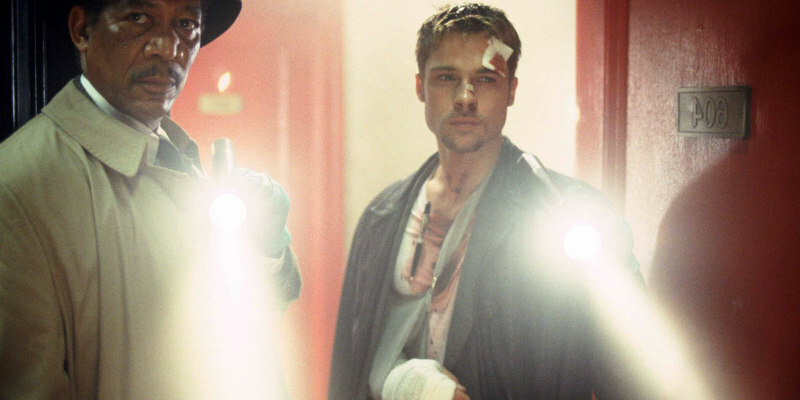 After putting his arm through a windshield during a chase scene and severing a tendon, director David Fincher wrote Pitt’s injury into the film. Following a fight with the film’s main villain, played by Kevin Spacey, Pitt can be seen wearing a cast on his arm. What many people don’t know is that this cast is real, and that Brad Pitt actually broke his arm during filming. For the scenes before the big fight scene, that were filmed after the incident, Pitt’s cast was hidden from view for continuity reasons. During filming of the now iconic film, Margaret Hamilton, who was playing the Wicked Witch of the West, sustained severe burn injuries after a pyrotechnic stunt went horribly wrong. To make the Wicked Witch magically disappear from one scene, smoke was meant to cover her as she exited, coupled with jets of fire once she was out of the way. Unfortunately, during one of the takes the trap door that was meant to get Hamilton safely out of the way malfunctioned, and so she was subjected to the flames. After being burned in this way, Hamilton took six weeks off filming the film, and once she returned, refused to film scenes that used pyrotechnics of any kind. So there you go, six actors who sustained injuries whilst filming. Hopefully this article gave you more information on how movies can go horribly wrong, and why acting should be considered a dangerous job!